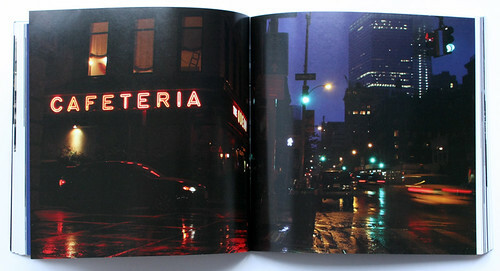 While the title could have easily materialised as an annotated book of photography, Rinaldi instead delves into the history of neon and pre-neon signage dating back to the ‘shadow-box’ or ‘silhouette’ signs of 1807 onwards and goes on to plot the evolution and anatomy of lighting technology including neon’s rise and fall in popularity, growing sympathy for the medium in the mid-1960s and ‘the LED revolution’ of the 21st century. 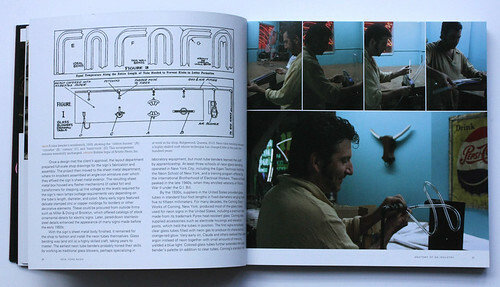 Spread featuring a drawing of a tube bender’s workbench and Robbie Ingui of Artistic Neon, Inc.
Top: cover design by Modern Good. Rinaldi is an advocate for the preservation of these dying examples of vernacular design. He photographed the signs at the same time each day, shedding a (dusk) light on them that conveniently emphasises their most appealing features and reaffirms his argument. Close cropping leaves the signage somewhat decontextualised at times, yet gives the book visual continuity. 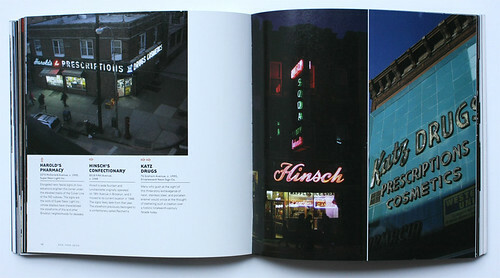 Spread showing Harold’s Pharmacy (1955), Hinsch’s Confectionary (1948) and Katz Drugs (1955), Brooklyn New York. Spread showing The Coffee Shop (formerly Chase Coffee Shop, 1960) and Collins Bar (1930), Manhattan. 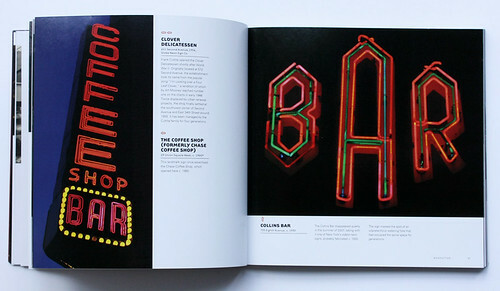 As Rinaldi admits compiling a photographic collection of neon signs is not a new idea. The more arduous task of locating the signmakers and installation dates of each example is what gives the project its significance, together with the grit of daylight signage and images of the men and women who keep them lit. 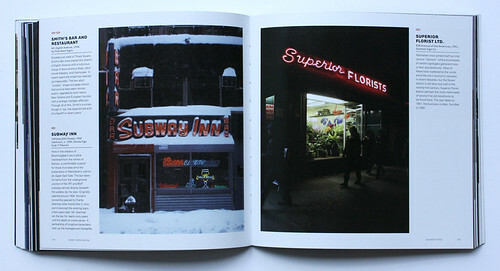 Spread featuring photographs of Smith’s Bar and Restaurant (1954), Subway Inn (1950 and 1955) and Superior Florist Ltd. (1951), Manhattan. 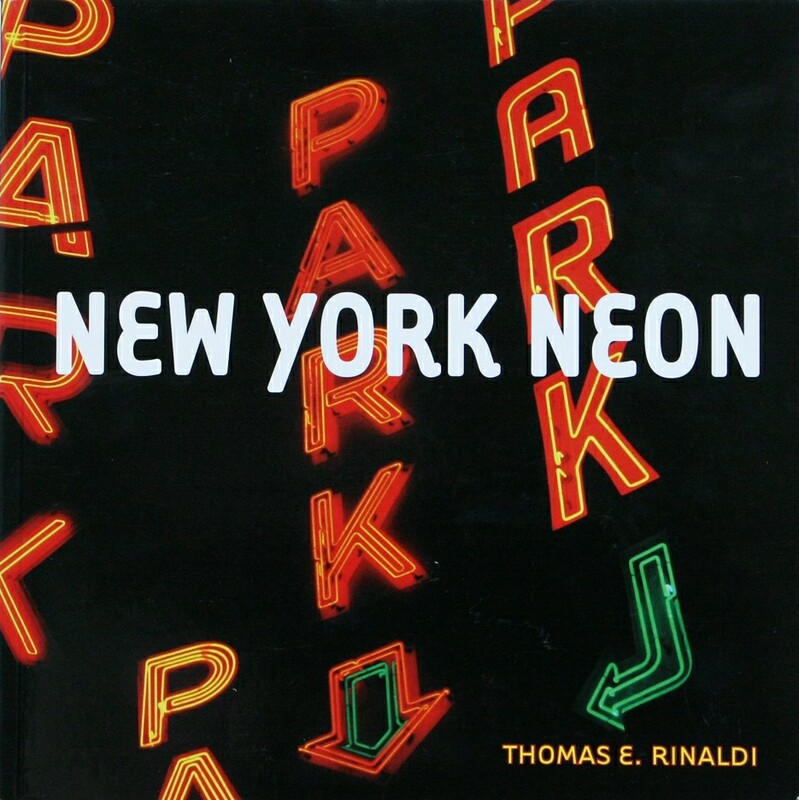 In the book’s final essay, Rinaldi makes the case for the adoption of preservation and conservation projects alongside regulating landmark status for New York’s on-premise storefront signs that, ‘have a tremendous impact on our experience of the city.’ With examples such as Los Angeles-based Museum of Neon Art and the Neon Museum in Las Vegas, New York Neon is a tribute to neon’s continued endurance in the city’s outdoor museum of light. The Odeon Restaurant, 145 West Broadway (Manhattan), installed 1933 by Astor Neon Sign Co.